Emerald City ComiCon is a comic book convention held each year in Seattle at the Washington State Convention Center. While a comic book convention in name, ComiCon embraces nerds and geeks of all kinds, bringing in guests and exhibitions focused on TV shows, video games, role-play games and more. So don't be shy. Go forth with your brand of nerdery and prepare to enjoy. More than 80,000 people attend over the course of the weekend! ComiCon is all about bringing together fans and artists/performers/creators of all sorts. 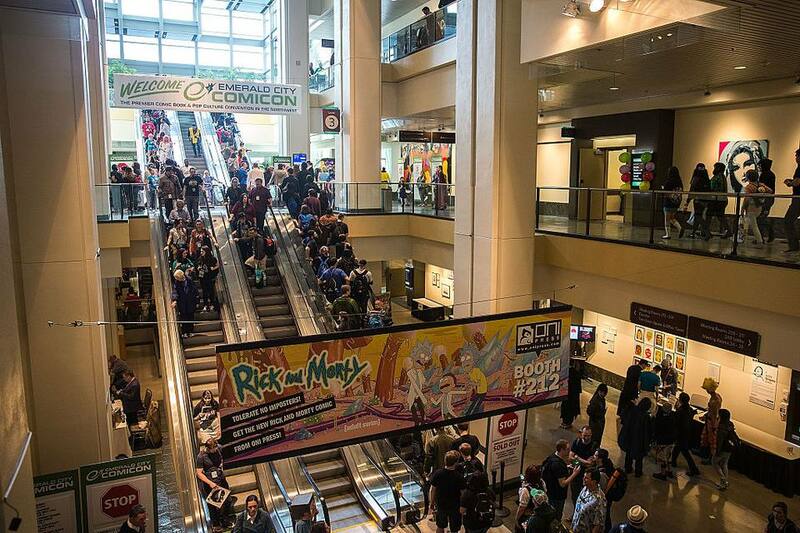 Seattle ComiCon brings in a full range of vendor and display booths, special guests and stars, photo opportunities, contests and games galore. Many of the exhibitor tables have comic book artists, creators and writers. Media guests and voice talent guests present on a schedule posted on the event’s website. The main event at ComiCon is the large exhibitor hall filled with comic retailers and businesses from all over. Exhibitors also sell statuettes, action figures, and comics - of course. There may be no finer place in Seattle to find that copy of Uncanny X-men #350 or vintage issue Superman. Other events include everything from writing workshops to Image EXPO, a unique event where fans, writers, retailers or anyone else can get up close and personal with comic writers, artists and more. Each year, ComiCon brings in dozens and dozens of guests for talks and autographs. Spotlight guests are often the most anticipated and include stars from TV, movies, books and the comic world alike. In 2018, spotlight guests of note include Summer Glau and Sean Maher (Firefly); Shannon Purser (the doomed Barb from Stranger Things); Matthew Lewis (Harry Potter); Khary Payton (The Walking Dead), Felicia Day (Supernatural); Chris Claremont (artist on X-men comics) and dozens of other artists, writers and actors. The list goes on and on, though, so check the full list to see who's on and which day they'll be at the event. Emerald City ComiCon tickets are available from the event’s website as well as from many comic stores in the Seattle-Tacoma region. Tickets are cheaper if you buy in advance rather than at the door. Tickets for 2018 are available as day tickets or a pass for the entire event. In advance, ticket prices start as low as $30 for a day pass (more if you buy at the door) up to $120 for an all-day pass. Kids 6 and younger are free, while kids 6 and older will need a ticketBuy early as tickets can and do sell out. Because ComiCon is held at the Washington State Convention Center, there are many hotels within a six block radius if you want to stay nearby. Most nearby hotels also offer discounts on food and/or parking for ComiCon guests, but make sure to ask for discounts in advance to check what’s available. Also look into Seattle's most romantic hotels or the best hotels near the airport, if you want to save a little money over staying downtown. You can take the Link between the airport area and Westlake Center, which is only blocks from the convention center. The Convention Center is located close to downtown Seattle, as well as the First Hill and Capitol Hill neighborhoods, meaning there is a plethora of restaurants within a short walk or drive. Right outside the main entrance, though, is a covered area with several dining options, which are most ideal for ComiCon guests who don’t want to go far. The Cheesecake Factory, La Creperie Voila (no seating area), Subway, Blue C Sushi, and Cafe Yumm are all located under the canopy or near the front of the building. To get to the Washington State Convention Center from I-5 North, take exit 164A for Madison Street. Take a right on Madison Street. Take a left on 8th Avenue. Garage parking entrances are located on your right under the freeway overpass. To get to the Washington State Convention Center from I-5 South, take exit 166 for Stewart Street. Take a left on Boren. Take a right on Seneca. Take a right on 8th Avenue. The parking garage entrances are on your right. While the Convention Center parking garages are the most convenient, if you want alternative parking options, there are other garages and pay lots within walking distance. For more information, see the Emerald City ComiCon website.